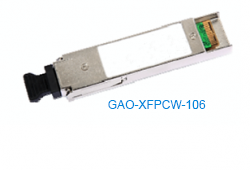 GAOTek’s XFP CWDM (Coarse Wavelength Division Multiplexing) transceivers are first grade hot pluggable modules used with single mode optical fiber for sale to the United States, Canada and Globally. The devices are designated as per their transmission speed specification. 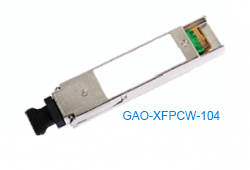 XFP CWDM Transceivers use an electronic to optical converter to translate signals in the transceiver. 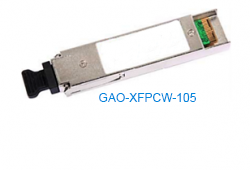 These transceivers use (Coarse Wavelength Division Multiplexing), one of the two methods for wavelength division multiplexing in fiber optic communication, to multiplex various signals in one fiber optic cable by using different wavelengths of light. 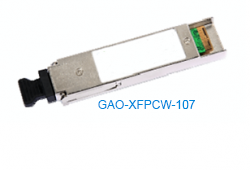 GAOTek’s XFP CWDM transceivers are equipped with a CWDM EML type or a CWDM DFB type transmitter and a PIN type or an APD type receiver. These hot pluggable modules are built for ease of use with the standard bail release mechanism that facilitates easy insertion and removal. The built-in digital diagnostic functions allow real-time access to operating parameters such as transceiver temperature, laser bias current, transmitted optical power, and received optical power and transceiver supply voltage. They come with a sophisticated system of alarm and warning flags.